I learned during my stay in Montréal that the locals are quite proud of their bagels. The Jewish immigrants who came to the city from Eastern Europe before and after World War II brought with them a distinct tradition of bagel making that continues today. 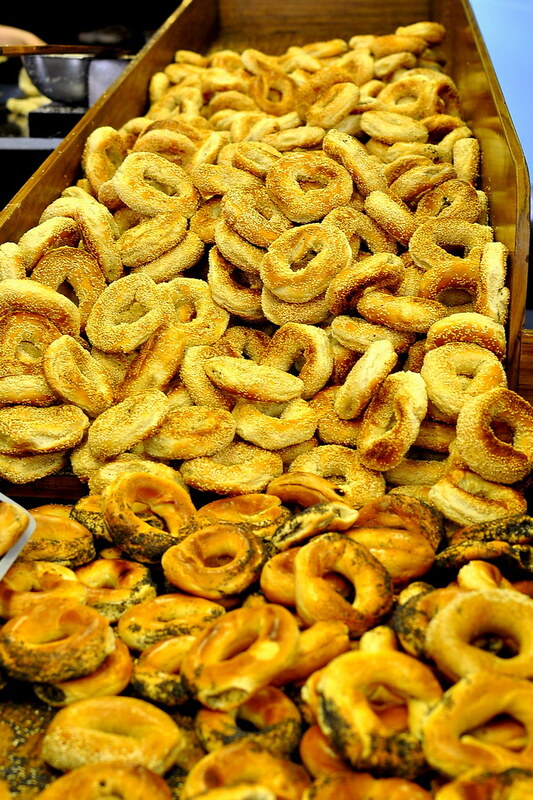 Montréal-style bagels are hand-rolled, boiled in honey-infused water, and baked in wood-fired ovens. In contrast to their American counterparts, the ones in Montréal are smaller, sweeter, and denser, with a crisp and smokey crust. 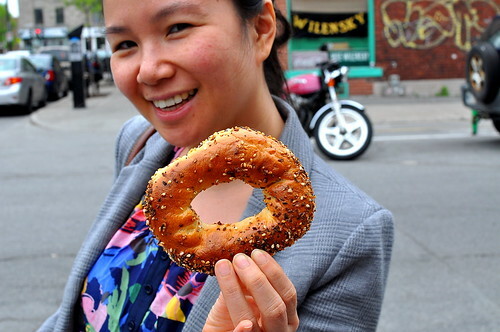 Since two of the city’s most famous bagel shops are located in the same Mile End neighborhood, The Astronomer and I, along with our lovely friend Nina, set out on a bagel tasting. Our first stop was at The Original Fairmount Bagel Bakery. Opened in 1919 by Isadore Shlafman, Fairmount is the city’s very first bagel bakery. The moment we stepped into the shop, we caught sight of a baker transferring a batch of freshly baked bagels from the oven to a plastic bin using a long wooden slat. The man’s swift motion ensured that all of the bagels ended up in the bin and none on the floor. The two most popular flavors among the local set are poppy seed and sesame seed. I’m an “everything bagel” kind of girl, so I went with the one dubbed “all dressed.” The still warm-to-the-touch bagel was covered with a mixture of onion, garlic, caraway, sesame seeds, poppy seeds, and coarse salt. What really set this bagel apart from ones I’ve eaten in the past was its crisp and slightly smokey crust, which was imparted by the wood-fired oven. The dough was also just a touch sweeter and chewier. The Astronomer chose his favorite, a cinnamon raisin bagel. Whereas my bagel was still warm from the oven, this one was not. As a result, it tasted more or less like bagels stateside. Perhaps he should’ve taken our hosts’ advice and chosen one of the more popular flavors. Stop number two was a short walk away at St-Viateur Bagel. 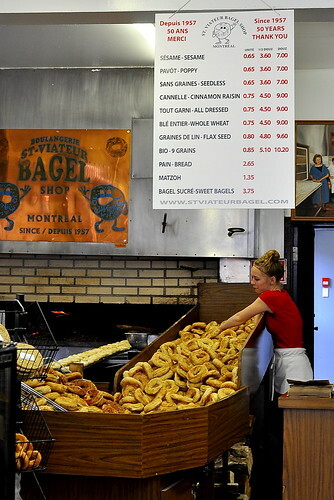 Opened in 1957 by Myer Lewkowicz, St-Viateur is open 24/7 and sells over 1,000 bagels each day. We were greeted by a most impressive cascade of bagels. 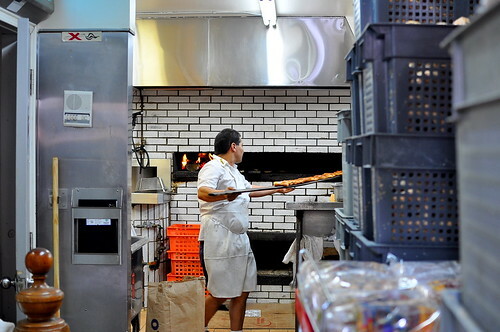 Once again, the wood-fired oven was blaring at full capacity and keeping the bakers on their toes. This time around, I went for a traditional sesame seed bagel because the shop had sold out of the “all dressed” variety. 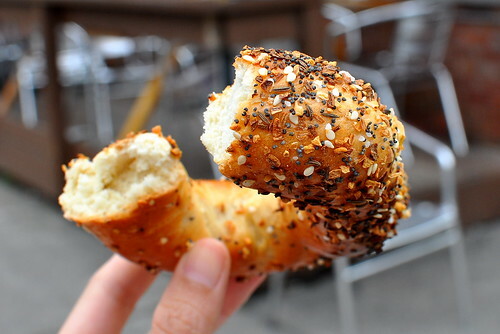 What was really terrific and unexpected with this bagel was the distinct taste of toasted sesame seeds. Also, without the addition of salt on the crust, I could really take in the dough’s sweeter notes. In order to compare apples to apples, The Astronomer chose another cinnamon raisin bagel. It was a completely unremarkable specimen that left The Astronomer wondering why Montrealers are so very proud of their bagels. Ouch. 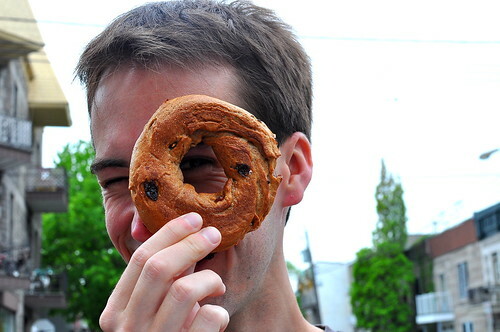 Montréal’s bagels, excluding the cinnamon raisin ones, are truly something special. Get ’em while they’re hot! I’m partial to the “All Dressed” bagels too! omg. i love that picture of the woman looking like she’s drowning in bagels!!!!! Ugh, Astronomer, a major no-no! 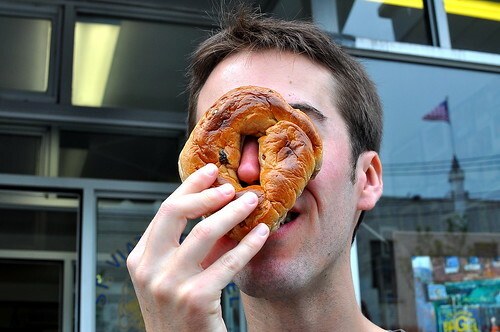 No Montrealer brags about the cinnamon raison bagels! They’re for the kids and tourists; the dough isn’t at all the same as the ‘regulars’. i go to montreal every so often for work. will make a stop here. honestly, the only place i’ve been to that was noteworthy was the gazette at the westin hotel. you must give me more recommendations as i’m going there in a month or two! Hey, great write-up. 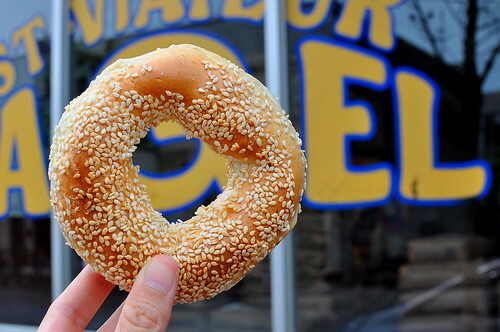 I’m headed to Montreal in a couple weeks, and I’ve been itchin’ to get my bagel on. If a grrrl only has the time for a single bagel stop, would it be Fairmount? Madame Fromage – Either shop would be a great Montreal-style bagel experience. St-Viateur has more locations around town, so there might one convenient to where you are staying. Of course, Farimount is THE original, so that might be worth the trek. Anyway, you’ll be eating well wherever you choose. I am from Montreal and on a recent trip to Vietnam had the chance to eat at most of the places that made your top ten list in Saigon and Hanoi. All the places that made it on your list were excellent but I am afraid this time I have to disagree with you. 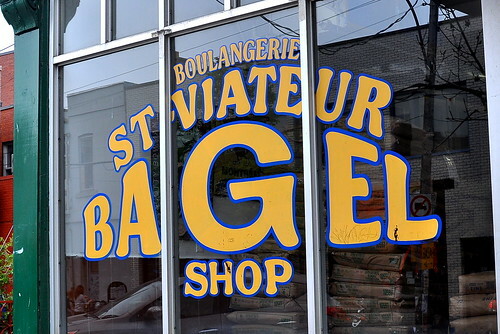 The only bagel worth eating is the sesame bagel and the only place to get it is St Viateur bagel on St Viateur street not even at one of their other locations. Raisin and cinnamon bagel? Really ! That is the equivalent of eating Cha Gio with Ketchup .I hope you had the chance to go to Wilensky’s light lunch while you were on Fairmount street. If you are still in Montreal get in touch with me I would be more then happy to take you out for luch. lol at your silly astronomer bagel model! I’ve been obsessing about bagels recently too… I love how the simple flavor of toasted sesame seeds adds so much complexity. 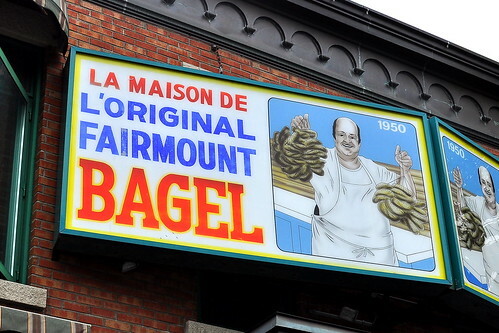 I was at The Original Fairmount Bagel Bakery 3 years ago when in Montreal. LOVED it. took me forever to find, but so worth it. As somebody who has been living in Montreal the past few weeks, and has sampled both Fairmount and St.Viatuers, I can say they are both excellent. Both offer amazing sesame and tout garnie (all-dressed) bagels. Those two ways are really the only way to go, and I can say that both are some of the best bagels in the world, and I have had my share of NYC and Montreal bagels.